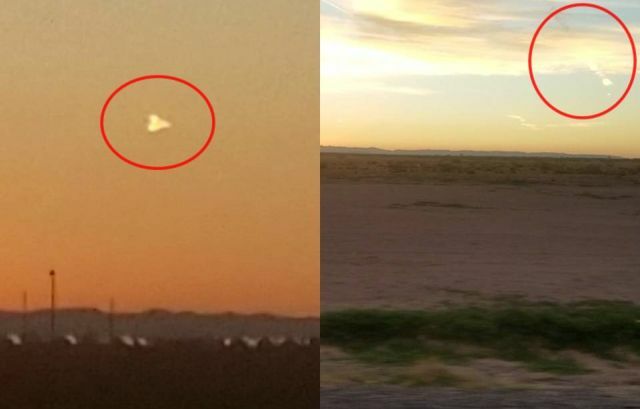 A glowing triangular object has been filmed in the sky above El Paso, Texas. At the start of the video another object is visible leaving a trail behind. Since the glowing triangle stays motionless in the air, it seems as if it is observing the first object. Witness statement: I was on my way to work the morning of August 31, 2018 at 6.25 in the morning. I stared at the sunrise as usual because I have to stop a red light, right before I get on the freeway to work. After a few minutes I glanced to the right and saw a glowing triangle and thought it was weird. So I took several pictures and a short video with my Samsung Galaxy S8 and did zoom in on the object and luckily it worked perfectly. The witness has submitted the video to Mufon case 94699.